This is a variation of the Cream Cheese Sausage Balls I posted earlier this season. My Mom actually inspired this variation. I was telling her about the Cream Cheese Sausage Balls, and she said that Boursin cheese might be good in them. Brilliant idea! The sausage balls were really, really good. They tasted great dipped in pizza/marinara sauce, and would even be good added to pasta as the meatballs. Like the original, these sausage balls were very tender and moist. They had a lot of great flavor from the Italian sausage and Boursin cheese. I highly recommend these make an appearance at your next gathering! 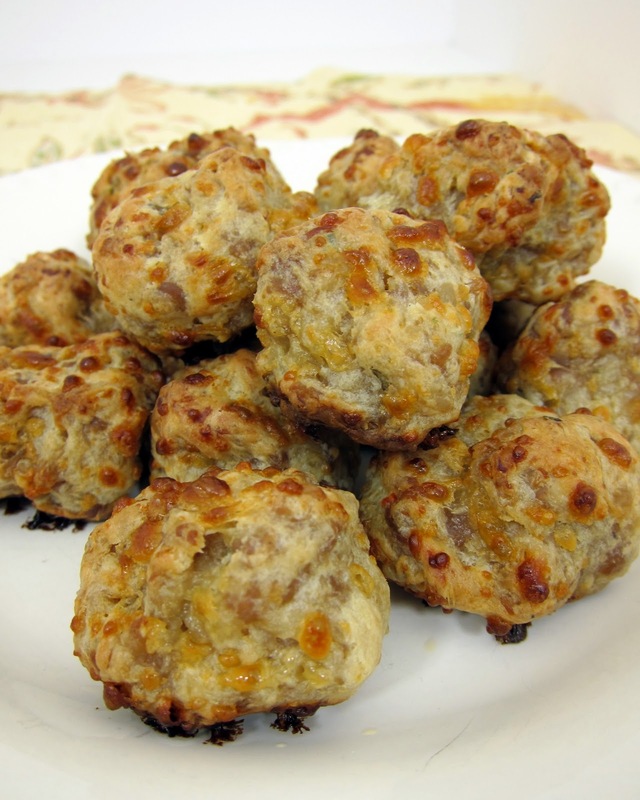 I made and loved the cream cheese sausage balls and they were a hit with all who tried them. Mine didn't stay shaped as balls, though...most of them looked a peculiar shape after baking, BUT...the taste was still great. Great idea Steph, I mean Mom, I like everything about these and will try them soon. You must have posted the other recipe when I was out for the State Horse Show. I missed it. Both look good, but I know I already have the ingredients for the 1st one so I need to make them. Is it wrong to want to make this for dinner tonight? I'm drooling!I don't care because this is what's for dinner tonight. Sausage balls are a Christmas tradition in my family! I've never added cream cheese, I'll have to give that a try. They look delicious! These beauties caught my eye when I saw your twitter post about them. I haven't had Boursin in months and as soon as I just saw the title, I was making a mental note to go buy some! I love this idea. I'm a huge fan of Boursin .. got to give this a try. Congratulations, Your recipe was chosen as one of my Marvelous Recipes of the week.